Bursting out of the ever-burgeoning Berlin jazz scene comes this high-energy project from Ehwald, best known in the UK as co-leader of the Anglo-German band Paragon. The album documents a series of live gigs around Germany with his unique twin-bass line-up. The shows must have been fairly intense affairs judging from these recordings. 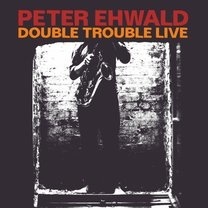 Ehwald operates in an area that’s rooted in composition, but ventures intriguingly close to the edges of free territory - “In The Zone” is powered by Burgwinkel’s twitchy funk drumming, as Ehwald and his bass team skirt around the tonal centre, neither committing fully nor completely abandoning it. “Mimouna” is closer to total freedom until Burgwinkel anchors another restless, propulsive beat and leads the song to a composed conclusion. The slower paced “Double `Trouble” gives the two bassists a chance to really bounce off each other - a clear stereo mix enhances the effect, and Ehwald demonstrates an attractively breathy tone on this melodic composition. Landfermann and Lang generally manage to stay out of each other’s way - one or the other swaps to arco on the faster “Mr Soju”, which also features Ehwald’s impressive command of multiphonics and other extended techniques. “Dreamband” has a melodic, almost pastoral feel, with the rhythm section simmering nicely away underneath. All the players match each other in their command of their instruments, and in their similarly unfettered imaginations. There’s a finely tuned balance of free improv and tight composition on display throughout - another example of Berlin’s emergence as a major centre for forward-looking jazz.